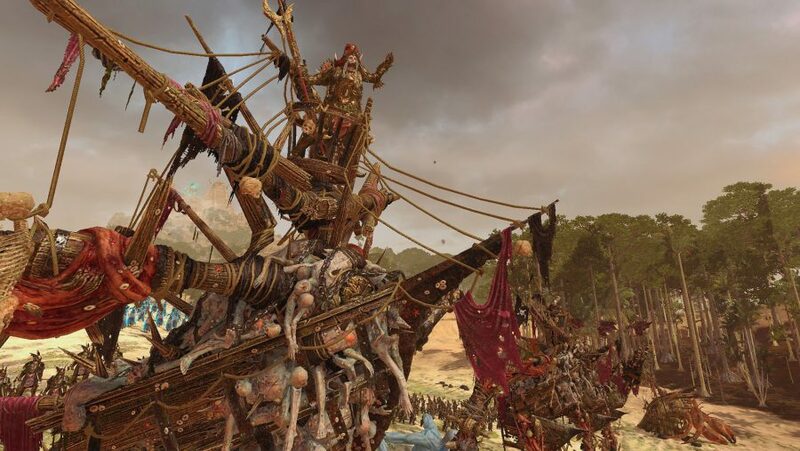 Perhaps it’s the slime glinting off its hull in the sunlight, but one star shines particularly brightly in Total War: Warhammer 2’s brilliant Curse of the Vampire Coast DLC trailer – the Necrofex Colossus. 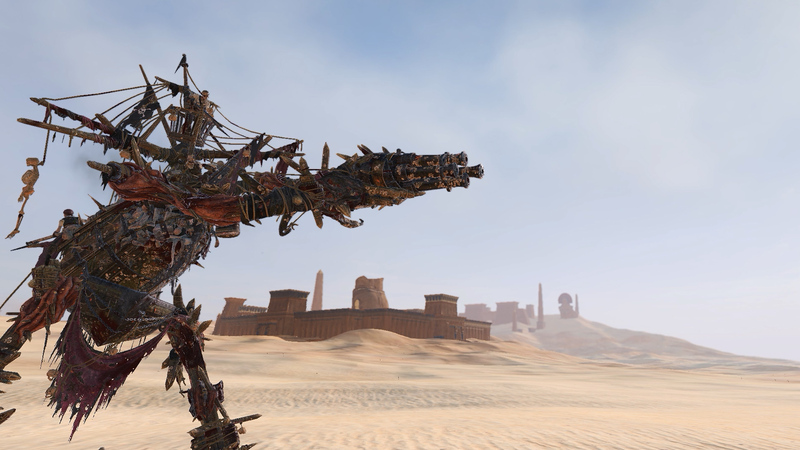 A towering construct built from pirate shipwrecks and corpses, it may be made of wood, but it’s the most metal unit in the game so far. 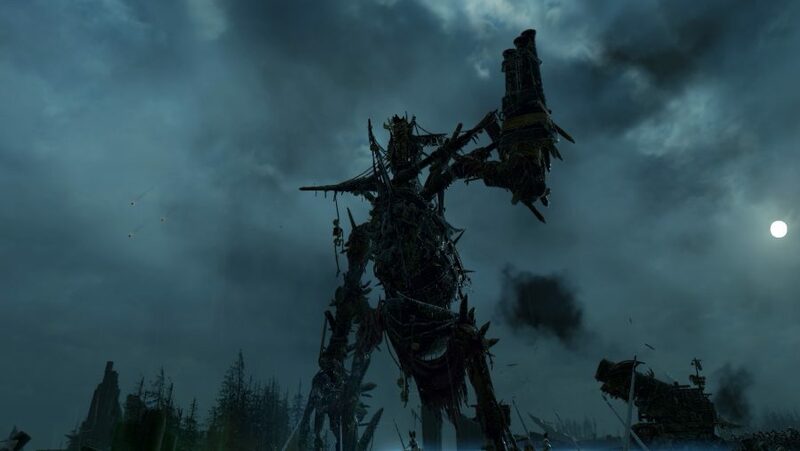 That’s why, when we got the chance to discuss the Vampire Coast with Total War developer Creative Assembly, the origins of the Necrofex Colossus were upmost in our minds. “We always go really deep into the lore, and we always know that we want to get big units that are crazy to look at,” explains designer Mitch Heastie. The Necrofex Colossus is mentioned in old White Dwarf magazines and army books, if you dig back far enough. The primary source, though, was Monstrous Arcanum – a compendium of rules for the outsized models that represent Warhammer’s more obscure monsters. “There’s lots of little tidbits here and there that we kind of all pulled together just to create one kind of overall vision,” Heastie says. Fitting for a monster cobbled together from driftwood and drowned sailors. We’ve seen shooting monsters before, like the Beastmen’s Cygor. But the Necrofex differs in one crucial respect – it can fire while moving. 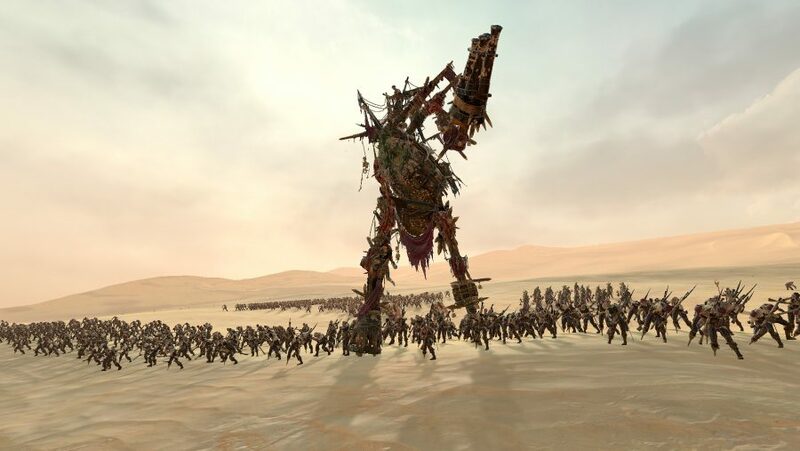 I often saw Necrofex Colossi rack up over 200 kills per battle, and having stumbled once at the final battle of the campaign, brought six along with me when tailoring my army for a second attempt. After that I won handily. But both Deans and Heastie say it’s not overpowered, and has its weaknesses. “It’s got decent health, but its armour is pretty poor. You can burn them down quite quickly if you can catch them”, though we wouldn’t advise pursuing with anything that doesn’t have the ‘anti-large’ specialism. The Vampire Coast also have plenty of options to slow you down, and you’ll be weathering cannon fire all the while. The Necrofex Colossus was the star of the Vampire Coast reveal trailer, which did much to turn antipathy at the prospect of more undead into excitement. The arch comment that "CA is so determined to not have naval battles they just gave the ships legs", was typical. If these mechanical conversations are half of the concepting process, the other half concerns personality – giving the unit its soul, if you will (a thing that the Necrofex lacks in at least one other sense). The key word Creative Assembly wanted to convey with the Necrofex Colossus was “intimidating”. ‘Intimidating’, though, is an odd word to describe something so memeable and, in a certain light at least, comic. This is, after all, a rickety walking ship with a rotating cannon on its arm. It’s bizarre and absurd, like a 17th century Transformer, and while I’ve never pretended to understand what Michael Bay was attempting with those movies, if it was to make Transformers scary, he failed. And yet, in the lore, the Necrofex Colossus is terrifying. Its wood is fused with corpses which are then reanimated through magic and living sacrifices to give it impetus. You can see them in the game, reaching out of the Colossus’s chest piece – which, again, is the hull of a ship, and brings us back to that absurdity. Is it me, or is there a bit of a tonal disconnect there? This is the Necrofex Colossus as it appears in Monstrous Arcanum - its best 'official' depiction to date. Monstrous Arcanum is a trove of huge monsters, some of which got models courtesy of Games Workshop's specialist miniature makers Forge World, but never made it into an official army book. Probably because they would break the game. But there’s another problem Creative Assembly had to solve. The Monstrous Arcanum sketch is evocative, but it’s a long way short of a technical blueprint. How does an artist go about making a fully poseable rig from something so messy? And having done so, how should it move? As we learned when discussing the Hell Pit Abomination, a rig that looks sensible when static can take a turn for the silly when set into motion. The Necrofex, with all its spiky pieces of wood jutting out at odd angles, looks especially prone to clipping bits of itself into other bits of itself. As it turned out, adding a gun – which you’ll notice the original Monstrous Arcanum sketch does not have – exacerbated these problems. We’ve seen undead constructs before, in the Tomb Kings. But the Necrofex Colossus is different in so many ways – construction material, craftsmanship, armament, personality. Where your Necrosphinxes and Hierotitans are all efficient, animal power in their attack animations and barely move when idle, the Necrofex is rather less… stony.